It was Dean&apos;s 13th birthday, and he was waiting for his parents to come home with the gift every 13 year old anticipated. The necklace that would help him find the one person his heart would truly belong to. His mind wandered as he watched the clock. What would his soulmate be like? Would she be pretty? Would she like his impala? Most importantly, when would he meet her? Questions raced through his head at 1000 miles an hour, none of them answered. His train of thought was only broken by a tug on his sleeve. He looked down to see his little brother, Sam, smiling up at him. Sam was only 9, and worshiped Dean like he was the only thing that mattered. And since Dean was turning 13 today, Sam was going to be there to watch his older brother receive the necklace that every child awaited. "Hey Sammy." Dean smiled at the small boy next to him. 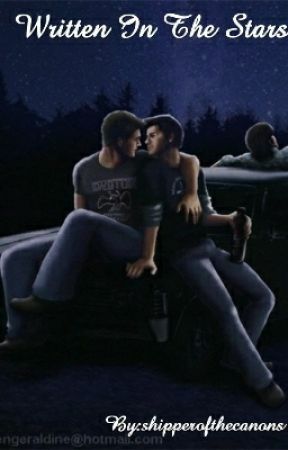 Sam wrapped his arms around Dean&apos;s arm, placing his head on Dean&apos;s shoulder and smiling up at him. "Are you gonna get your necklace today, Dean? The one that connects you to your soulmate?" Sam blinked up at his brother, and Dean&apos;s smile grew even wider. "Yeah, I am." He pulled the nine year old up onto the couch next to him. "What do you think she&apos;ll be like?" Sam grinned at his brother, a joke hatching in his little mind. "I think your soulmate will be a guy!" 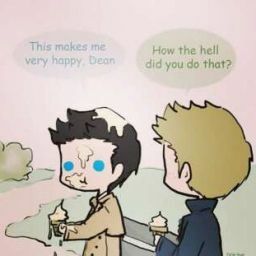 He giggled, intentionally falling off the couch and out of Dean&apos;s reach. Dean laughed, clearly knowing Sam wasn&apos;t serious. "Sammy, that&apos;s gross! No, I bet my soulmate will be some pretty blonde girl that likes my car and my music." Dean smiled, his eyes stating into nothing as he imagined his soulmate. About 5 minutes later, his parents came in the door. His mom was smiling, holding out a small gray box. His dad sat down on the couch, a small smile playing at his lips as he watched the scene unfold. Dean gently took the box from his mother, staring at it in awe. Sam stood on his toes by Dean&apos;s side, trying to catch a glimpse of what the shape of the necklace would be. Removing the lid, Dean lifted the chain and pendant out of the box with a smile. The shape was an incomplete music staff, with a treble clef and a few notes before ending in a shard looking line. Dean couldn&apos;t have imagined anything better. Castiel was passing the time by pacing back and forth across his room, his mind playing out every possibility for his soulmate. His sky blue eyes stared at the floor as he walked. He had no idea what to expect from his soulmate. She would probably average looking, but that wasn&apos;t what  Cas cared about. Would she be kind? Would she love animals? What was her opinion on books? What did she believe in? After a solid minute of pacing and wondering, Cas stopped in his tracks as the door opened downstairs. He stepped out of his room, and before he could properly close the door, his 4 elder brothers and 2 younger ones ambushed him. they picked him up, chanting his name, and carried him downstairs to his awaiting parents. Laughing, they placed him on his feet. His mother, a redhead named Anna, smiled and shook her head. His father, Chuck, laughed at his son&apos;s foolishness. "Here, Castiel. Happy birthday." Anna handed Castiel a small white box held shut with a transparent silver ribbon. He opened it and lifted the chain. The pendant on the chain was the end of a music staff, with a few scattered notes. At least his soulmate would like music. Castiel placed the chain around his neck and smiled as his siblings all whooped and cheered around him. Everything was perfect in the Novak household.